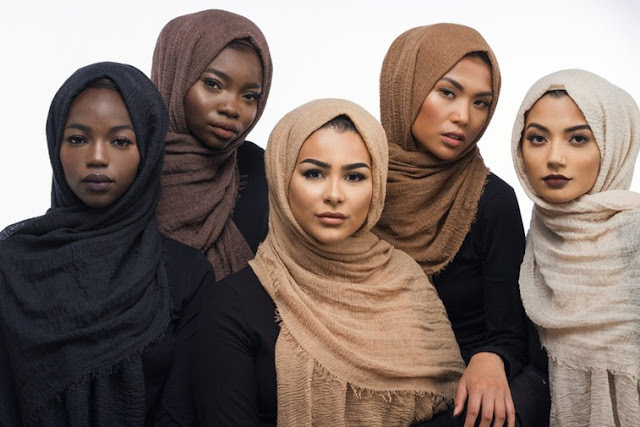 Lifestyle blogger Habiba Da Silva has launched Skin, a line of hijabs meant both for men and women. The collection — which has already sold out — currently includes four options priced at about $25 each, and are named for a different characteristic of marriage. They're also each in a different language. The lightest hijab shade is called Zaffeh, meaning "wedding march" in Arabic. Next is Rukhsati, Urdu for the "sending off" of the groom and his family with the bride. Second to last is Aroosadda, which means "bride" in Somali, and the darkest hijab is called Aure, which means "marriage" in Hausa. Habiba told Buzzfeed News, "I wanted to do something where everybody was [included] and I wanted to showcase different people together. I wanted to break the barrier of having too many companies who just used lighter-skin models." While most of the response to Skin has been positive, Habiba has encountered some negative feedback over the price of the hijabs. Refinery 29 notes that the average hijab costs between $12 and $15, and Uniqlo's collaboration with muslim fashion designer Hana Tajima rings in around there as well. While you can't purchase one of Habiba's inclusive hijabs at the moment, she told Buzzfeed she has plans to restock (and expand!) the collection soon. Go girl.